*Loveboat Summer Love-In Boarding Pass! £45 for a season pass to all 4 Fringe shows. Strictly limited so be quick! Purchase in person at the Summerhall box office by August 2nd or until sold out. Limited availability. 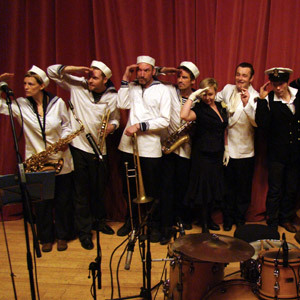 Let Edinburgh’s favourite All-star Big Band take you on a magical mystery cruise, sailing every festival Friday. Channelling the spirit of legendary Fringe institutions like the Bongo Club Cabaret and La Clique, these multi-dimensional voyages of delight will feature aerialists from All or Nothing, with their cutting-edge fusion of circus, ariel theatre and dance , The Miss.Fit Sisters,splicing spectacular aerial antics with sassy retro style, PLUS DJs, swing dancers and a myriad of festive surprises. Prompt embarkation is recommended for the show’s alfresco overture, welcoming you aboard in suitably deluxe style for a truly resplendent night’s revels. "This crème-de-la-crème Edinburgh collective combine the glamour of old-style cruise liners with a healthy dose of tongue-in-cheek humour"
"Note-perfect recreations of old standards rubbed shoulders with artfully aged arrangements of more recent tunes. . . 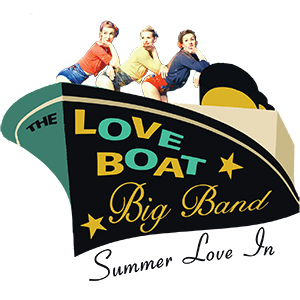 The Loveboat is a wonderful conceit: part music, part theatre, part mayhem; always pure enjoyment"
"Simply brilliant! You MUST see them"